Big BIG FINISH Week: Doctor Who - ORDER OF THE DALEKS Review | Warped Factor - Words in the Key of Geek. You probably need an artistic or design background to have come up with this story. Mike Tucker, former ‘maker of stuff’ for the TV version of Doctor Who has quite a pedigree when it comes to writing Big Finish stories – this is the man behind Dust Breeding and The Genocide Machine, after all. Sure, there’s The Warehouse too, but moving swiftly on, Tucker’s not usually short on interesting ideas, and has form when it comes to finding new, philosophically interesting things to do with Daleks. 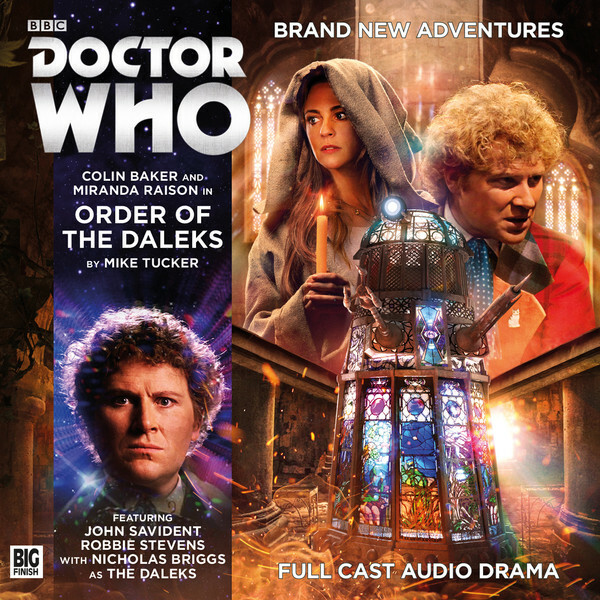 Anyone who’s seen the ridiculously good cover art for Order of the Daleks knows there’s another potential hit here, because the Daleks have never looked this beautiful. The set-up for Order of the Daleks takes a grab-bag of fairly solid, standard Who ideas, and shakes them about a bit – there’s a paradise planet that’s eschewed technology, there’s a crashed spaceship, there’s a bossy space bureaucrat and his long-suffering sidekick. And there are monks. Lots and lots of monks. Monks mean monasteries, mean corridors and catacombs, and in this instance, mean fine craftsmanship in the media of lead and glass – the stained glasswork of the Brotherhood of the Black Petal is very well renowned, considering they keep themselves pretty much to themselves on a level three planet that no-one in the great blackness of space is supposed to interfere with, on pain of a severe ticking off from the Galactic Census Bureau. Two things are important to know. Firstly, these are monks right enough, but they have a little more in common with members of the peyote church in the deserts of America, inasmuch as they make a preparation from a very rare flower, (the Black Petal of which they are the Brotherhood), and frankly guzzle it so as to be ‘one with nature.’ So, blissed-out hippie monks, then. And secondly – the interlopers in the crashed spaceship don’t give a waggling eye-stalk for non-interference in the progress of other races. That means the conquest of the monks by the aliens is inevitable – unless the census-takers, Senior Assessor Pendle (played with a magnificent vocal corpulence by John Savident), and his junior, Asta (Olivia Hallinan) have a say in matters. Oh and of course the Sixth Doctor and Constance Clarke, who simply happen to have popped down to the planet Strellin on their way somewhere. The crashed aliens are of course Daleks – you knew that, they’re on the cover and in the title. But what Tucker does here is weave them into the story in a way that’s both historical and brand spanking new. Historical inasmuch as, for instance, it makes a certain sense that this story was released around the time the animated Power of the Daleks came out, because in some regards, there are similarities between the two – Daleks without blasters, Daleks in dire straits, begging for the help of the locals and regaining their strength, regaining their influence until they’re able to take over and get their extermination on. Brand spanking new inasmuch as these are Daleks of lead and stained glass, which we’ve never seen before, Daleks which have to find a new way to control their bodies, and Daleks which land, or crash, incredibly lucky, discovering a source of new power that could see them rise to terrifying new heights of dominance. Oh yes, it’s all going on in Order of the Daleks! What’s more, there are some interesting riffs on historical non-Dalek stories too – it would be remiss not to mention Nicholas Briggs getting his Padmasambhava on as Abbot Tanapal, and there are other Abominable Snowman riffs too, particular as regards the nature of the Dalek evolution. And while Daleks made of stained glass probably shouldn’t throw stones, there’s some solid Dalek body-horror here too, as Dalek mutants gestate in what are basically stomachs, and get fed by a kind of umbilical and blood sacrifice. In fact, the Daleks have rarely been more physically visceral and disturbing than they are in this story – a neat counterpoint to the supposed beauty of their new, artistically designed casings, which Constance, on her first encounter with a Dalek, more fascinated and entranced than scared. Not for nothing, there’s a beautifully comic Dalek moment when Leading Wren Clarke first encounters the sons of Skaro – she regards them as beautiful and can’t resist telling them so, leading to the helpless, weaponless Dalek almost wailing at her to ‘Stop talking!’ Douglas Adams would have been proud of that one. If there’s a weakness here, it’s really two-fold. On the one hand, there’s not a great deal for the pair from the Galactic Census Bureau to really do, meaning we end up with teams of the Doctor and Pendle, and Asta and Constance, which teams seldom give enough contrast to really push the tension up. On the other hand, the assessors do need to be there, if only to give the Daleks a mid-story power-boost. And the second weakness – and we fully accept that it’s an odd one – is that there seem to be too many characters in the story. Everybody eventually gets a fundamental reason to be in the story, so that’s not the issue, it’s just that along the way, there’s a sense of a few too many story-balls being in the air, meaning the actual ending is something you almost have to force yourself to remember needs delivering, because the story seems to be done halfway through Episode 4. It genuinely isn’t, and on a second listen, it flows more freely; Tucker gives you so many threads that you do actually need the ending, but because there are so many story-balls in the air, you have to nudge yourself to remember that the people involved in the actual ending aren’t already dead. Performancewise, with the notable exception of Nick Briggs, and Colin Baker bringing his Doctor’s now trademark moral courage, scornful humour and charm, it’s mostly about the women in this story – a delicious perversity for a story set in a monastery. Miranda Raison is really coming into her own as Constance, showing the compressed ‘get the job done’ courage of wartime people, but expanding Constance beyond the stereotype she has enormous potential to be, and never letting her settle into anything quite so simple. And Olivia Hallinan brings Asta’s arc to believable life here, a woman belittled and challenged, who comes through adversity and finds her own strength in a world on the edge of destruction. Order of the Daleks has much to recommend it – both a new threat to add to the Daleks’ arsenal and a new look that adds perhaps the most dangerous element to them, by making them physically beautiful. There are strong performances in many of the key roles, and it sits happily alongside some of the second tier Dalek stories from both the TV years and the Big Finish back catalogue. Where it misses out on top tier status is in that overpopulation of the plot, which leaves it feeling slightly dislocated towards the end. But the Sixth Doctor, Constance Clarke and a bunch of stained-glass, blood-drinking, monk-ruling, drug-taking Daleks? You can’t really go wrong, and Mike Tucker absolutely hasn’t.